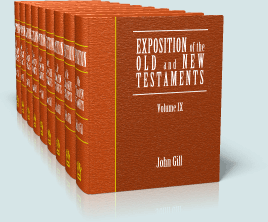 Exposition of the Old And New Testaments, the magnum opus of John Gill, is the largest Bible commentary ever written by a single individual. 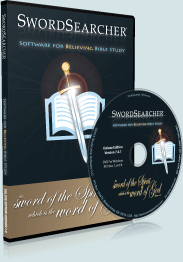 The entire nine volume set is included in the SwordSearcher study library. Gill, called "the great Baptist Hebraist of England" by B. H. Carroll (Interpretation of the English Bible, vol 1. ch. 8), stood firmly against the disbelieving "rationalist" movement of his time, defended the traditional pronunciation of Jehovah and proved the existence of vowel points in the original Hebrew text, and in his commentary on 1st John 5:7 shows why the strongest Scripture text on the doctrine of the Trinity is authentic Holy Writ. With explanatory commentary on nearly every phrase of almost every verse in the Bible, Gill's work is so thorough and detailed that it has been called "ponderous" by critics. However, a treasure-trove of insight, historical information, and exposition awaits a patient and diligent reader. Gill's commentary offers a summary of each book, each chapter, and exposition of each verse. [John Gill] published a voluminous COMMENTARY ON THE HOLY SCRIPTURES in nine volumes folio, remarkable for the copiousness of its glossary, the brilliance of its argument, his apprehension of prophecy, and the richness of his Hebrew scholarship. His preparations for the pulpit having, as is well known, furnished the materials for the press, we can but reflect on the priceless value of his ministry. The eulogy pronounced upon him by the Rev. Augustus Montague Toplady, a well-known contemporary divine of the Church of England, was doubtless well merited. He says, "that his labors were indefatigable, his life exemplary, and his death comfortable if any one can be supposed to have trod the whole circle of human learning, it was this great and eminent person. His attainments, both in abstruse and polite literature, were equally extensive and profound, and so far as the distinguishing doctrines of grace are concerned, he never besieged an error which he did not force from its stronghold, nor ever encountered an adversary whom he did not baffle and subdue."